You are here: Home / Family / Motherhood / Are you a Radical Homemaker? 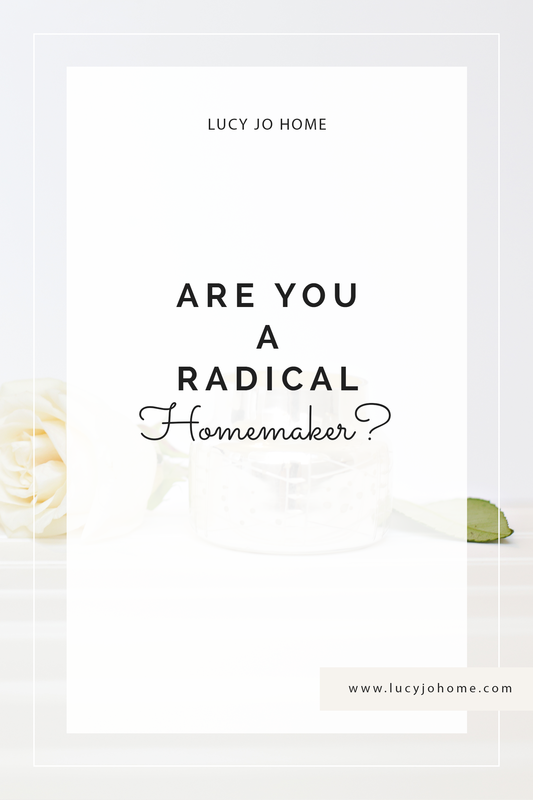 To know if you are or not, you need to know what a radical homemaker is. A radical homemaker is changing the traditional perspective on the word homemaker. They are challenging the widely accepted paradigms and re-writing their own definitions of what homemaking means. I believe wholeheartedly in the last two lines of William Ross Wallace’s poem. When I write poetry it is to honor the mothers who are tired, confused, lonely and so filled with love for their children. The world continues to devalue women, so it is so important that we honor and encourage each other! but in the midst of trying to have equal rights, too many have supposed that men and women ought to be the same. This is ridiculous since science and common sense tell us that men and women are different in so many good ways. I don’t feel suppressed because I am not as intelligent or capable as a man; many special women have proven and still prove that this is false over and over again in history. I feel suppressed because I am being measured by what a man can do and not by what I can do inherently well. I have three daughters that I have carried and brought into the world. This is a power and gift that no man can have. And yet, I feel like I am wasting away my life while I spend most of my days feeding, clothing, and teaching little people. I read an article recently about an intelligent woman who did years of scientific research validating what many people have considered truth for a long time: new mothers should be with their children for the first threes years of the child’s life. She has been received with open arms and hostility. There is an excerpt from the article that has me thinking about how the future can be brighter for women. I love and honor my husband; he is not free to do whatever he wants-he supports a family of five. He has set aside many of his interests to provide and protect his family. No one balks at his efforts. I choose to spend my days doing daily chores like cleaning dishes, folding laundry, changing diapers and fitting in my personal passions of writing and decorating my home. There may be fewer people than I think who consider my life to be useless, and I know my kids would never tell you that what I do has no value. This is what I hope for my daughters…choices and reasonable expectations throughout all the stages of their womanhood. to have a child and care for it well during the most vital parts of their life. to not fear that they will become stagnant or useless when they spend a portion of their life caring for family and running a home. to change the world in a personal way. to do and be whatever she pleases. I had my last two daughters 18 months apart. To say it was difficult is an understatement. I dealt with depression, anxiety and confusion. I wanted to feel like I mattered and that I was contributing. I wanted to leave the house occasionally without worrying about breastfeeding or changing a poopy diaper. I wanted to have everything at the same time. I need my children-they are my everything-but I also wanted to feel the praise and approval of the world and for some odd reason, I didn’t feel like being a stay-at-home mother was good enough. I don’t think I am alone in this thought. Instead of shaming women for making family a priority and thinking a woman is backward when she sets aside other ambitions to care for children, let’s applaud and honor women and encourage them to care for their family and continue their own personal progress. Homemaking happens when we fully understand the value of home in our lives. Homemaking happens when we intentionally make home a safe house, a trauma unit, a pep rally, a playground, a school and more. Somebody has to have the time and energy to bring those roles alive in a family’s life. Somebody has to make a house a home. Homemaking is majoring in family relationships. I think Laura Ingalls Wilder captured it best when she said, “Just as a little thread of gold, running through a fabric, brightens the whole garment, so women’s work at home, while only the doing of little things, is just like the golden gleam of sunlight that runs through and brightens the whole fabric of civilization” (Savage, 2007). I wish that I could have written the above passage. It speaks to everything that I work for on this blog. So many people are trying to solve the world’s problems, and they seem to blame the economy, politicians or bad luck. If we want to solve the world’s problems, again, we would revere and respect women and their role as homemakers. I want my girls to be excited to be a woman and proud to be a mother. I am a happy and radical homemaker because I realize that homemaking is a comprehensive and challenging job that requires more than a pair of hands and mindless tasks. If you don’t make a home, who will? What are the consequences of everyone forgoing homemaking? Before the world, and even family life, begin to infiltrate children’s mental paradigms, they want to grow up to be the people who care about and help them…a mom, a teacher, a dad, a fireman. I hope that I can live more joyfully in this stage of my life so that my daughters will look forward to it for themselves. I will keep trying and praying that my girls remember more good than bad. My hope is that you will join me in being a happy mother and a radical homemaker!